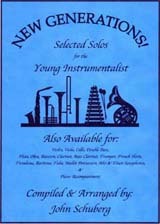 This collection of solos is designed for young instrumentalists of all levels of development. The simple accompaniment parts and alike concert keys make them ideal for band directors and/or larger group situations. The wide variety of styles and skill levels are especially attractive to more individualized or private instruction. Available for: Flute, Oboe, Bassoon, Clarinet, Bass Clarinet, Alto & Tenor Saxophones, Trumpet, French Horn, Trombone, Baritone, Tuba, Snare Drum, & Mallet Percussion.